If you want the option of teaching at primary or secondary schools, the Bachelor of Education (P12) is for you. Choose your specialisation, and get the classroom experience needed to confidently begin your teaching career. We are one of the few universities in Australia to offer a Bachelor of Education (P-12) which allows you to teach at any school level. If you’re unsure which age group you’ll be suited to teaching, this is an excellent way to keep your options open. You’ll learn the latest techniques to support students in their learning. You’ll also get real work experience through 80 days of supervised teaching practice in primary and secondary schools. With an education degree from VU, you’ll be job-ready before you graduate. You’ll have had extensive experience teaching in a classroom and you’ll be ready to work locally or overseas. Throughout the course, you’ll work in primary and secondary settings to complete at least 80 days of supervised teaching practice. Graduates from the Bachelor of Education (P-12) are qualified to be accredited by the Victorian Institute of Teaching (VIT). The VIT is a statutory authority for the teaching profession. Legally, you need to be registered with VIT to be employed in a school. Footscray Park has everything you need, all set a pleasant stroll from the Maribyrnong River and parklands. The average salary of secondary school teachers in Australia is A$78,000 (Job Outlook). Primary school teachers in Australia earn an average of A$72,800 (Job Outlook). 93 per cent of our Bachelor of Education students are employed within the first four months of graduation (VU Australian Graduate Survey). 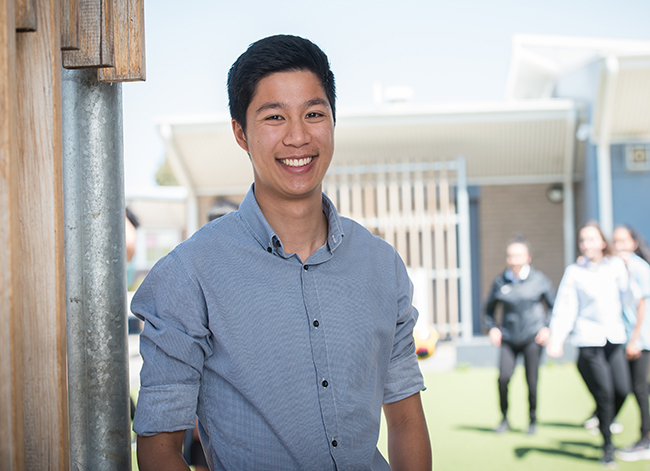 VU’s extensive practical placements and industry connections took Joshua Le from the classroom into his dream career as an educator. Graduates from the Bachelor of Education are qualified to be accredited by the Victorian Institute of Teaching and to teach in primary and secondary school settings. Students are required to pass the Literacy and Numeracy Test for Initial Teacher Education (LANTITE) in order to be eligible to graduate from their Victorian Institute of Teaching-accredited program. 48 credit points of any Minors or Elective units. Students are required to meet the required benchmarks for LANTITE prior to commencement of their second year placement units. Students also complete a minimum of 80 days Professional Experience comprising well-structured, supervised and assessed teaching practice. 11. Engage with the profession in order to challenge understandings and practices, heighten professional satisfaction, ultimately leading to the enrichment of educational opportunities and contexts for students. Successful completion of a non-academic attributes assessment, for example, the CASPer test or equivalent. CASPer is an online test designed to assess and applicant's personal and professional attributes and is a requirement for many initial teacher training courses in Victoria. Completion of an Australian Senior Secondary Certificate (VCE or equivalent) with an ATAR of 70 or above (after adjustments) including Units 3 and 4: a study score of at least 30 in VCE English (EAL) or 25 in any other VCE English. Completion in two units (any study combination) of Maths: General Mathematics, Maths: Mathematical Methods or Maths: Specialist Mathematics or Units 3 and 4: any Mathematics. Completion of 2 units of any VCE Maths (or equivalent). A study score of 35 in English (EAL) equals 5 aggregate points. A study score of 30 in English other than EAL equals 5 aggregate points per study. A study score of 25 in any Mathematics equals 5 aggregate points per study. A study score of 20 in any Business, Drama, any Humanities, any Information Technology, any LOTE, Physical Education or any Science equals 5 aggregate points per study. Overall maximum of 15 points. ATAR [and Selection Rank] profile for those offered places wholly or partly on the basis of ATAR in 2019 - all specialisations. Completion of 22451VIC Diploma of Teacher Education Preparation. Successful completion of the Diploma of Education Studies with a minimum average of 70. Completion of an Australian Senior Secondary Certificate with an ATAR of 70 or above (after adjustments) more than two years ago. Completion of Units 3 and 4: a study score of at least 30 in VCE English (EAL) or 25 in any other VCE English (or equivalent). Completion in two units (any study combination) of Maths: General Mathematics, Maths: Mathematical Methods or Maths: Specialist Mathematics or Units 3 and 4: any Mathematics (or equivalent). Completion of 2 units of any VCE Maths (or equivalent). Students will also have to satisfy the National requirements for teacher registration through satisfactory completion of the National Literacy and Numeracy Test for Initial Teacher Education Students prior to starting the course or prior to commencement of their second full-time year of study. A satisfactory achievement of the benchmark of the test is required before course completion for teacher registration can be approved.